Balancing Act: B is for…Buffy! ﻿﻿This is about the television series. We're going to pretend the movie was never made. I can't remember if I watched Buffy the Vampire Slayer when it was first on television. In the later 90s, I was living in Nome, Alaska, and was a bit disconnected from popular culture and television. What I do remember, is watching it a few years later with my older daughter when she was about five (and several times since). We both loved it. Heck, she even had a credits dance to the Nerf Herder song. expectations. She was little and pretty. She'd been a cheerleader. In my own judgy way, I'd expect her to shallow and uninteresting. But she had a calling, a calling that made her life dark and messy, full of weapons, stealth, and secrets. The show didn't hesitate to explore the toll the work took on the young woman: how it affected her relationships, her social life, her finances, and her soul. 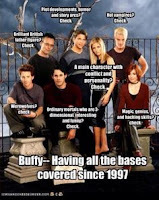 Buffy also had a fully realized supporting cast: The Scoobies. It's a reminder to me as I write my own superhero stories, that the people who surround your heroine are vital to the life's blood of the story. Their presence or absence, their expectations, support and disappointment, the pressure and conflict they provide: all the juicy stuff of story. I'm still a Buffy fan today. I've read some of the comics. I have the musical memorized. Buffy is definitely a hero who stuck with me. Yay for Buffy! That's one of my all-time favorite shows. A perfect selection for the A to Z Challenge! Love the show, own all of them! She was definitely my hero! perfect example! 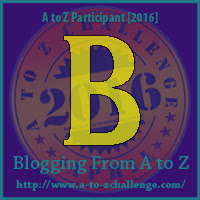 Happy A to Z Challenge Day 2! LOL, me too, just finished watching Firefly on Netlix! I just re-watched that one, too . . .and then Serenity. Did you see his adaptation of Much Ado About Nothing? Samantha, I've watched the entire series on Netflix and since the days of Buffy there have been plenty of vampire series. I love them all! Good choice! Some of the others have been too much soap opera for me. I came to Buffy very late, but really like how she seemed like a regular kid when she wasn't slaying vampires. Yeah. She wanted ordinary things like a boyfriend and good hair. Hey, I loved the movie! :P I don't think the TV series would ever have been made without the movie. I actually haven't seen the movie in years and years . . .and I didn't hate it when I saw it. I do have a taste for cheese in my movies, after all. But I don't remember it being nearly as good as the series. I remember going to see Buffy the movie in the theatre. But yes, the series was much better. The show had a wonderful cast of interesting characters. And with the longer form, they all got to really grow and change. Yay Buffy! Still one of my favorite shows of all time. :-D Now, you're my favorite. I have never watched any of the Buffy stuff. The whole current vampire/zombie/supernatural thing just doesn't appeal. Maybe it's an age thing. It definitely melded genres. A little teen drama, a little soap opera, a little gothic, a little action, superhero, supernatural, etc. That's not for everyone. Buffy is awesome - a great choice for B. I actually love the film too, it makes me laugh, a lot :). You're right the supporting characters are so important too. Willow was the best nerd-girl-finds-her-own story I had seen at the time. I've never watched Buffy bar a few episodes here and there. I know, *gasps! 😂 but I dig your one-liner for your own story, a menopausal superhero doubts quite awesome actually! Thanks :-) I'm having a great time writing the series. 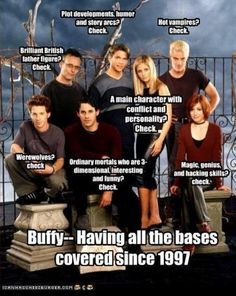 My daughter says I'm a closet buffy fan, I loved the movie and the shows. I even loved the spin off of Angel, although watching him now on "Bones" is a little disconcerting..lol! It is funny how you get stuck in a certain character for an actor, then have trouble accepting them as someone else. I always preferred Willow and Tara in the series myself.